YOU NEED TO RESEARCH COLLEGE BEFORE YOU GO! I’m sorry. I don’t like to shout at you. It’s not very polite. One trend I’m seeing in our economics classes is of the people who intend to go to college 80% of you have no idea where or why. It’s like someone said you had to do something after high school but you were never sure what. The first week of class was dedicated to setting SMART goals. College is one of the most expensive purchases you will make. Yes, that’s right. Purchases. Investments. Emptying of your wallet, depending on your perspective. The jury’s out on this one, folks. Many economists are conflicted. Some say you should go to college right away because you will have increased earning potential. Others say the thousand plus percent increase in the cost of college over the last decade cancels out that benefit, and entrepreneurship is the way–find a mentor, network, and research to get into your field. I’m going to stand in the middle on this one. For some of you, college is a must. I don’t want my neurosurgeon apprenticing and googling the answers. Sorry. But then again, there are, in fact, some degrees that are worth more than others. Take a look at this graph. 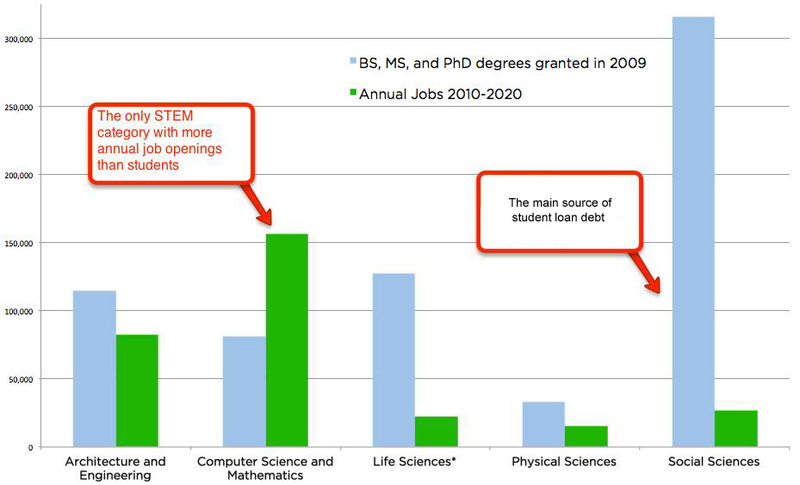 This shows there are many more people than jobs for mathematics and computer science degrees. Sadly, it shows my field as the one with very few jobs and a surplus of degrees. 1. Research your colleges. In order to do this, you should have a spreadsheet. I made one for you. You can cut and paste this into a working spreadsheet in your google drive, this one’s read-only. Feel free to add or subtract columns for things you value, like clubs or athletics. 2. Know the deadlines. They come up quick. You should be reviewing your spreadsheet for deadlines. 3. Narrow down colleges to a “yes,no,maybe” column. If possible, visit colleges on the likely list. 4. Look at the $$$$ column. Pay attention to scholarships and deadlines for scholarships. There are a ton of scholarships in areas you might not think about–corporate, ethnic, religious, gender, or experience-based scholarships. This requires research, application time, and hard work. It’s a part time job. 5. Fill out your FAFSA. This is the form that goes to colleges telling how much financial need your family has. Do this immediately after your family files their taxes. Some aid is first-come-first served. Being early helps here. 6. 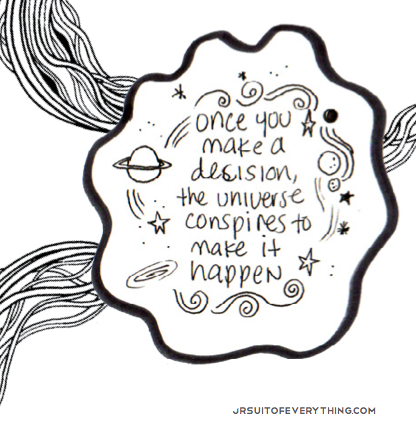 Don’t decide based on one factor. You have to be able to pay for the college once all the aid comes in. Sure, I’d like to own a Ferrari, but it doesn’t make sense. I’m broke, and my neighborhood gets snow. Potholes alone rule out the Ferrari. college is not an emotion based decision. IT’S AN ECONOMIC ONE. Sorry. I’m screaming again. 7. Think outside the box. I can’t recommend the Reserve Officer’s Training Corps program enough. The military, if you qualify, will pay for your degree(s) and give you a commission as an officer. In an economy where many qualified people are in debt and underemployed, it’s a reassuring thing to get out of college loan free with a guaranteed job. Again, you’ll need to attend to every detail in the application process, which is coming up quick. I fell in love with this manifesto–before you go back to playing Call of Duty or ignoring your parents, stay with me. It’s been scientifically proven that you are what you do and who you hang out with. Your top five friends will shape your life. Think–who are your friends? What do they stand for? Do they bring you up or down? In ten years, will your friends be game-changers, innovators, or sitting on a bar stool somewhere never making anything happen. If you don’t know who your five best friends are, check your Facebook or Twitter feeds. Who is there the most? If you count the positive comments and then the negative comments, which number would be greater? What is the life you would like to lead? If you’re going out into the world next year and wonder what that’s going to look like, I urge you to read The Life and Times of A Remarkable Misfit by A.J. Leon. He left his high-powered job to travel the world. If you read one page, you will become inspired, if you read two, you will probably start making plans to do something, and if you read the whole thing, you may just change the world. 1. You can write about anything, and if you do it well, people will pay you and you will get a large following. So, write about things you love, do it well, and back up what you say with evidence–that’s basically the bottom line of every class I teach, by the way–I’ve researched some pretty obscure things, and my graduate advisor wrote about baseball in history. If he can do that, you can do anything! 3. You should be reading stuff like this more often. I’m not saying you have to read Eric or me, or anyone else for that matter, but the fact is, you all have so much technology at your disposal. When you use it to do smart person things, you get smarter. I like to be the dumbest person in the room on occasion, because that means I get to listen to really smart people. Reading smart people’s stuff is sort of the same way. I get ideas, vision, and it lifts me up. When you spend your time doing things that don’t increase your brain power, everyone else just got that far ahead of you. It’s a scientific fact. So, research and follow a couple news channels, blogs, motivation sites. Follow the areas that matter to you–could be anything…the environment, inspirational quotes, sports heroes, public policy people doing the right thing, the Dalai Lama on Facebook…Anything. So, get out there, and change yourself for the better. Start by reading Eric’s wonderful article.